Or at least I couldn’t. I think I devoured at least 3, maybe 5 slices of warm cornbread before I plated them for pictures. So, if you have been on the hunt for the perfect homemade cornbread that’s 1000X better than jiffy infused with butter, buttermilk, sugar and a hint of vanilla, this is it. 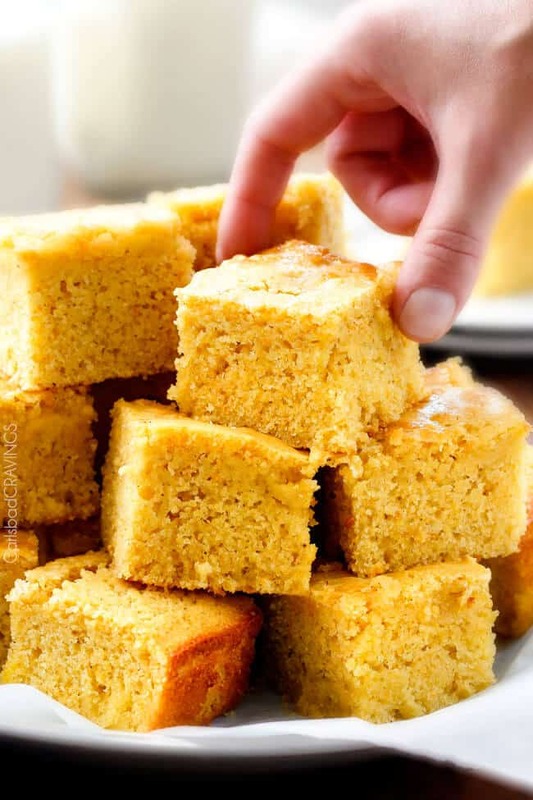 This Sweet Cornbread recipe comes from a family cookbook that is the “best of the best,” specifically from the exquisite Wendy Bagley and it is the best cornbread recipe I have ever tried. My mother-in-law gushed about this recipe a couple times and told me I needed to make it and said it tasted like “cake.” I’m just sorry I didn’t make it sooner! And so is everyone else. After I gave some Sweet Cornbread to a friend, she texted me that it was the “best cornbread…and [she] needed the recipe!” In fact, I make this cornbread recipe more than ANY other recipe to take to potlucks because I always have the ingredients on hand and because EVERYONE loves it! WHERE DOES CORNBREAD COME FROM? While Sweet Cornbread is a staple in our home, it is easy to assume it has always been around. But who do we have to thank for this tender, nutty invention? The Southern version of cornbread originated with the Native Americans. Native Americans had been using ground corn (maize) for food thousands of years in corn tortillas and tamales, well before European explorers even knew about the New World. European settlers, especially those who resided in the English Southern Colonies, learned the original recipes and processes for corn dishes from the Cherokee, Chickasaw, Choctaw, and Creek Indians. Today, there are thousands of variations of cornbread – but my favorite is still this Sweet Cornbread recipe! 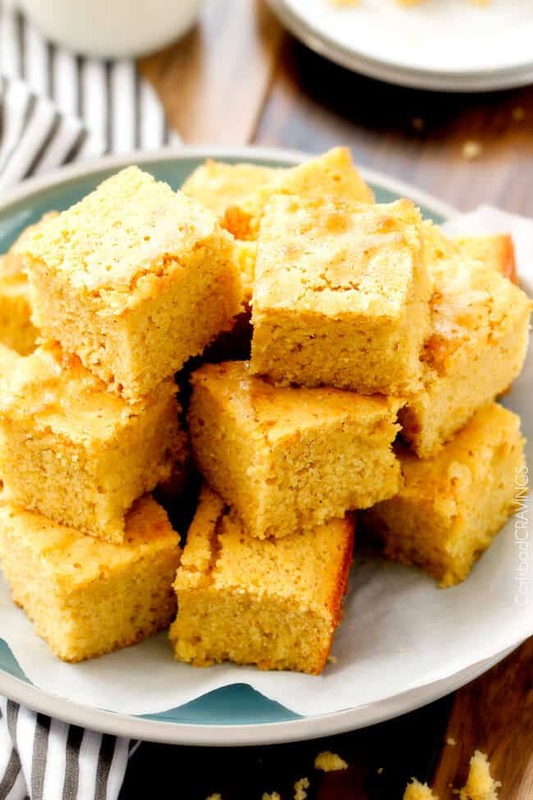 Butter: Butter is one of the main flavors in this cornbread recipe – please do NOT substitute it with oil or you will be missing out on some serious flavor. Use unsalted butter so we can control the salt in the recipe. 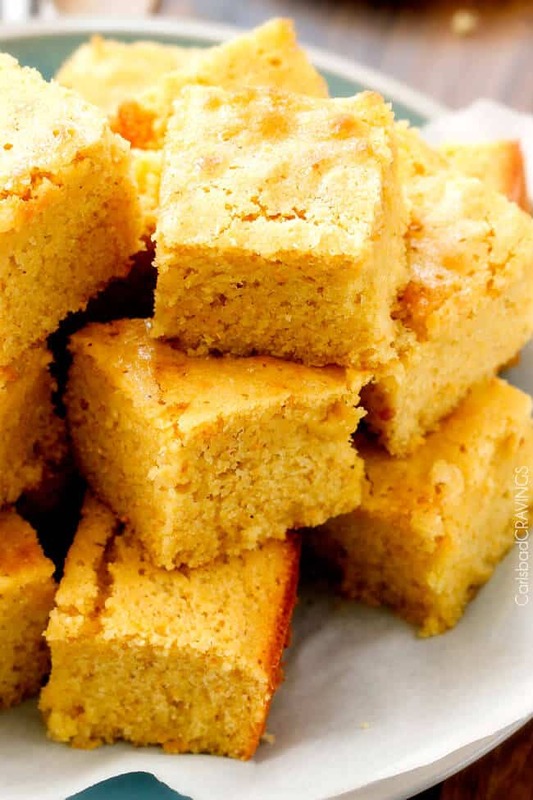 Cornmeal: Cornmeal is the star of this Sweet Cornbread recipe. Any cornmeal you pick up at your grocery store is fine -just take care it says cornmeal and not corn flour (more info on cornmeal below). I use equal parts cornmeal and flour to make the BEST cornbread. With 2 whole cups of cornmeal, you get lots of corn flavor and wonderfully crunchy edges. Sugar: I prefer granulated sugar as it enhances the pure flavor of the cornmeal. You may substitute a little brown sugar for the granulated sugar for a touch of molasses flavor but it will dilute the corn flavor. Flour: Flour is necessary to use in combination with cornmeal because the gluten in the flour holds it together. I use all purpose flour, but I’m sure gluten free 1 to 1 baking flour would also work. I do not recommend cake flour or self-rising flour or you will need to change the baking powder/baking soda, etc. Eggs: Eggs are the glue that binds cornbread ingredients together and provide the structure. Buttermilk: Buttermilk makes cornbread, cakes, muffins, and breads extra moist as the lactic acid reacts with the baking soda to leaven the cake and yield a tender crumb. If you do not have any on hand – don’t worry, I rarely do! You can make DIY buttermilk or sour milk for this recipe by adding 2 tablespoons vinegar or lemon juice to a measuring glass. Add enough milk (not nonfat) to equal 2 cups. Give it a stir and let sit 5-10 minutes in order to activate and slightly curdle. Vanilla: Use pure vanilla extract for best results. Like salt, vanilla enhances the flavor and is a beautiful compliment to the nutty cornmeal. Baking Powder & Baking Soda: Are an acidic leavening agent and a base leavening agent. They work together to create wonderfully thick, soft cornbread. Take care both your baking powder and baking soda are fresh, (throw out after 6-12 months) so they work! Salt: Salt adds flavors and cuts threw the sweetness. You want to use good old table salt. Cornmeal: is dried corn that is ground to a coarse texture. It has a strong, nutty corn flavor and can be white or yellow. It can be made into a mush like grits or used in baking like this Sweet Cornbread recipe! It is also the secret ingredient in my homemade pizza dough recipe and prevents the crust from sticking to the pan. Corn flour: is also dried ground corn meal with a nutty, corn flour but it is finely ground instead of coarsely ground. You should not use cornflour and cornmeal interchangeably because part of the characteristic charm of cornbread is the texture which will be lost if you use corn flour. Cornstarch: is made from the endosperm and not corn, has very little flavor, is usually very white and finely ground into a powder. It is 2-3 times better at thickening than flour is. Grits: are southern dish using ground hominy (or corn). Grits are usually a bigger grind than cornmeal. You can use grits for cornmeal in some applications, just know grits with be coarser, or you can run grits through a food processor. Polenta: is was the Italians came up with instead of grits. Polenta is a food dish made from yellow corn, whereas cornmeal is an ingredient. Polenta is ground more coarsely than grits. How Sweet is Sweet Cornbread? The original buttermilk Sweet Cornbread recipe is just as sweet as cake and positively delish but I prefer my cornbread to remind me of cake instead of taste like cake, so I usually cut the sugar by 1/4 cup and use 1 1/4 cups sugar. That being said, this is YOUR Sweet Cornbread recipe, so use as little or as much sugar as you would like. 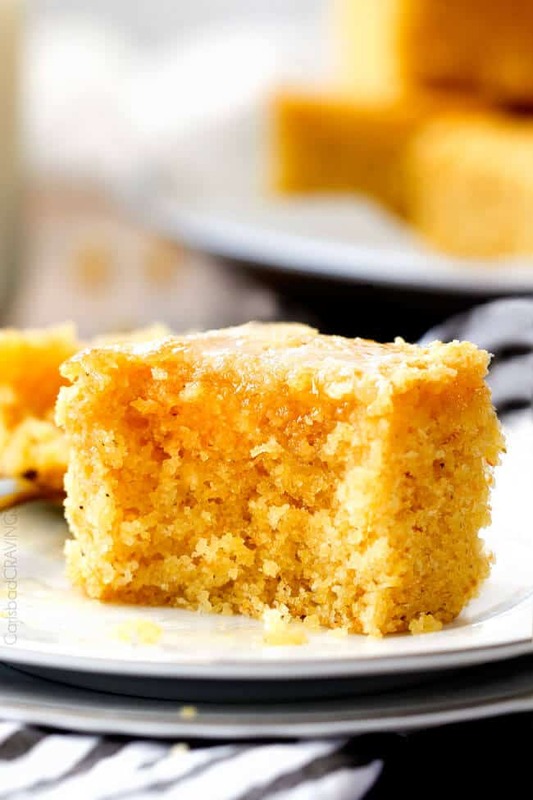 No matter how much sugar you add, this sweet, moist, tender, springy Sweet Cornbread belongs on your table, in your mouth and will earn a place in your heart. We all thank you Wendy! 1-2 finely chopped jalapenos for heat, or green chilies. the number one add in is corn! 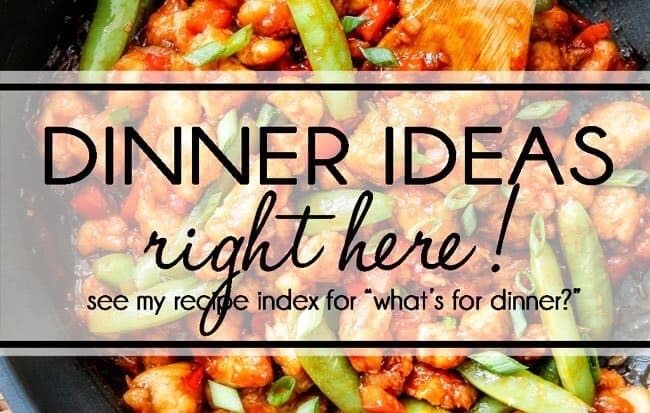 You can add fresh, frozen or canned corn. You can roast it with some peppers and onions as well for a smoky version. I recommend 2/3 cup corn. Or just one can if that is what you are using. 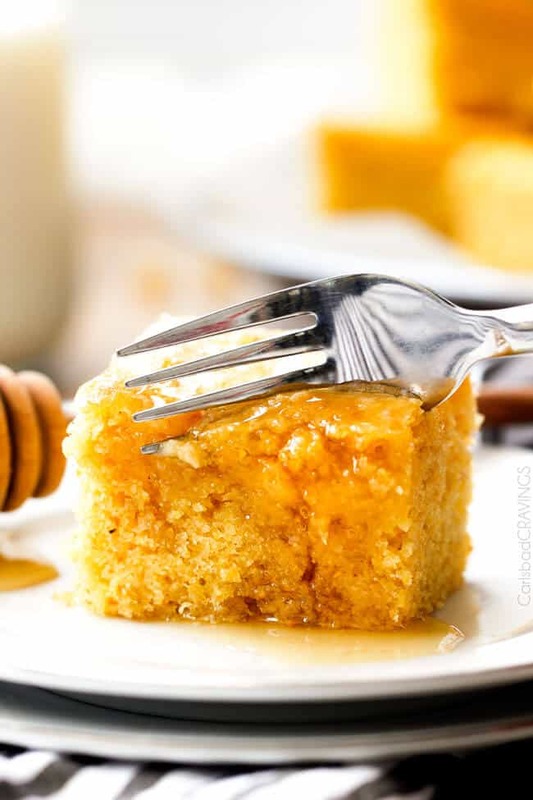 Fun alternatives for topping your cornbread, try a unique honey flavor. I love to add lemon or orange peel to honey and spread on top my cornbread. You can add lavender or clover as well! If you crave a crunchy crust then skillet Sweet Cornbread might be your solution! Pouring the cornbread batter into a hot skillet helps develop the cornbread’s crust. It sears the edges, sweetening the delicious crust and sealing in the center’s softness. To make skillet cornbread, use a 12 inch skillet for this recipe. Warm up the skillet and a add butter to melt. Once butter has melted, swirl it around and grease the sides of the skillet. Add batter and cook for the same amount of time. Keep an eye on it as cooking times vary! Cornbread is supposed to be a little crumbly due to the cornmeal but it should not be falling-apart crumbly, just – edges crumbly. I have never had a problem with crumbly cornbread with this Sweet Cornbread recipe – only uber most, soft cornbread. Don’t overmix: Overmixing develops the gluten and can cause dry, tough, brittle cornbread. Don’t overcook the bread. Check cornbread for doneness at the lower end of the cook time. Over-baked cornbread will also be dry and crumbly. What does Cornbread Go With? This Sweet Cornbread goes with everything! I serve it alongside: Slow Cooker Barbecue Ribs, and/or Nashville Hot Chicken, Barbecue Pulled Pork, Barbecue Chicken Kebabs, Oven Fried Chicken, Brown Sugar Glazed Ham.with some Baked Beans with Brown Sugar and Bacon, Kicked Up Potato Salad and Million Dollar Macaroni and Cheese on the side. Drooling. Can I Make Cornbread into Muffins? Absolutely! This Sweet Cornbread recipe will make approximately 2 dozen cornbread muffins. To make, follow instructions for the cornbread recipe then pour batter into two 12-count greased muffin tins. Bake for 15 – 20 minutes or until a toothpick inserted in the center comes out with a few moist crumbs. How do I store Leftover Sweet Cornbread? This Sweet Cornbread is so moist, the leftovers stay perfectly moist for breakfast, just waiting to be topped with a slab of butter and drizzled with honey. Seriously, amazing. For best results, wrap your cooled 9×13 a couple times in plastic wrap or transfer cornbread to an airtight container. Store at room temperature for up to three days or refrigerate for up to one week. Definitely! Frozen Sweet Cornbread keeps very well and makes a wonderful thaw and eat side or snack! To freeze whole: Cool cornbread completely. Wrap freezer safe pan tightly in plastic wrap two times followed by foil. To freeze pieces: Cool cornbread completely. Cut into squares or pie wedges and place pieces in a freezer size bag with parchment paper in between each slice. Cornbread can be frozen for 3 to 4 months. Defrost cornbread by letting it sit at room temperature for about 30 minutes or so. There is no need to thaw it in the refrigerator. To warm up Sweet Cornbread, wrap it in foil and bake at 350 degrees F for 10 to 15 minutes. Alternately, you can warm individual pieces in the microwave by wrapping in a damp paper towel and microwave for 20 to 60 seconds. Cornmeal, the basic ingredient of cornbread, is a whole grain. Whole-grain foods contain the bran as well as the germ and endosperm of the fruited grain — and all of the nutrients they contain. A 1-oz. serving of cornbread contains 1.8 g of fiber as well as calcium, iron, magnesium, phosphorus, potassium, folic acid, folates and vitamins A, B-6 and B-12. Cornbread also contains all 10 of the essential amino acids, building blocks for proteins that control growth, cellular processes and organ function. I could go on, but you can see already the benefits of cornbread! Prepared cornbread mixes may also contain extra sodium, sugars and animal fats so making cornbread from scratch is a healthier option than most packaged options in the store. You can make cornbread healthier by reducing the amount of sugar and not slathering it in copious amounts of honey and butter. You can also use organic cornmeal and swap some of the butter for yogurt, avocado, applesauce, etc, (you will need to research – the substitutions area not 1 to 1). You will lose a lot of buttery flavor, however, with any of these substitutions, so my vote is to make the recipe as Wendy intended. And love every second of it. Incredibly moist, tender Sweet Cornbread with just the right amount of sweetness makes the perfect easy side or warm breakfast. You will fall in love at first slice and won't be able to stop! Pour batter into prepared pan and bake 30-40 minutes at 350 degrees F or until a toothpick inserted in the center comes out clean. Let cool 10 minutes before serving. For best results, wrap your cooled 9x13 a couple times in plastic wrap or transfer cornbread to an airtight container. Store at room temperature for up to three days or refrigerate for up to one week.